I got a lovely box of sugar-free chocolates and an extravagant card today, but I’m sad to say that my Valentine got an I-O-U instead of the cherry pie he usually gets on his birthday and for Valentine’s Day. I’ve been working very hard and just forgot what day it was. Luckily, his second favorite treat, after cherry pie, is anything chocolate, and I have a lot of it around since I’ve been experimenting with some new chocolate recipes. His pie will show up eventually, but for now I will share my new way to make sugar-free chocolates with all of you and wish you a very happy Valentine’s Day! Adding liquid to melted chocolate is a big no-no. After years of using a powdered, dry sweetener (with sugar as the bulking agent) in my chocolate, I hit on a better solution. It lets me use one of the zero-carb sweeteners like liquid sucralose or stevia without causing the chocolate to seize and turn into a hard, dry lump. 4 ounces unsweetened chocolate, either in disk form or chopped. Line a baking sheet with parchment paper or foil and chill in the refrigerator if you want to make chocolate candy clusters. Chill a candy bar mold, available at craft stores, to make chocolate bars. Place liquid sweetener in a small saucepan. Add shortening and salt and place over very low heat until shortening melts. Cook and stir for 1 minute more to let the liquid evaporate. 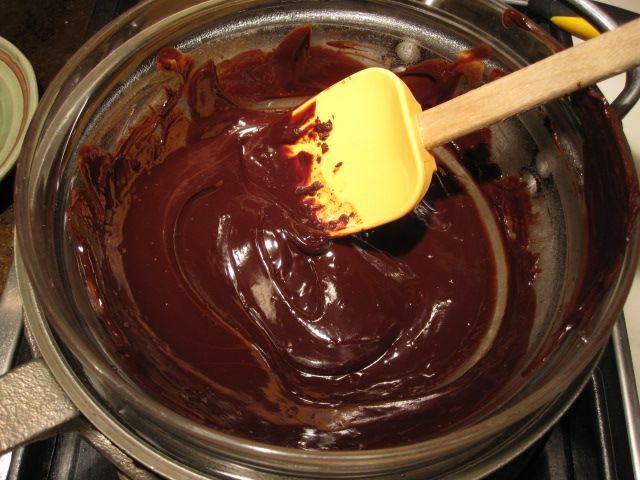 Stir in chocolate and continue to stir until almost smooth. Mix in chopped nuts, toasted coconut, or chopped, sugar-free dried cranberries, if desired. Drop by tablespoonfuls onto the chilled sheet pan to make nut and/or fruit clusters or pour melted chocolate into candy bar molds to make chocolate bars. Return sheet pan or molds to refrigerator until set. Store candies away from heat in a covered container. Wrap bars in foil. Makes 4 ounces total or 16 small candies. The number of chocolate bars will depend on the size of the mold. The whole batch contains 10.5 net grams of carbohydrate, so 0.65 grams for each of the small candies. Counts do not include nuts or cranberries. Bars and clusters, Candy, Chocolate. Bookmark. Judy, this sounds like a great recipe. I wonder, though, could I substitute coconut oil for the shortening? Yes, you can use coconut oil. In fact, you may want to use more so you get a bigger dose of good fats. I used Spectrum shortening, which is made from another good, saturated, tropical oil (palm), because it doesn't melt at room temperature. You may have to refridgerate your chocolates if you use coconut oil. I think, I will try out this recipe.